but feel free to read the beginning of the essay. The Yosemite Valley Railroad Company was incorporated in San Francisco, California on December 18, 1902. John S. Drum along with William B. Bosley, Sydney M. Ehrman, Thomas Turner, and Joseph D. Smith were named as directors. John Drum must have been named the president of the company because he controlled 980 shares, where the other had five shares each. Each share was worth $1,000.00. Thomas Turner was appointed Treasure of the new railroad. The articles generally stated that the company was to engage in and conduct the business of transportation of passengers, express and freight of every kind for compensation. It also, stated that the said business would construct and maintain a standard gauge railroad. Also, the articles contained the verbiage necessary for all railroad and transportation enterprises. 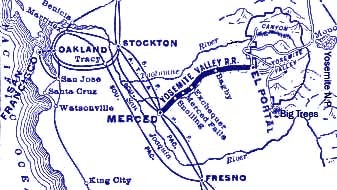 In principle the articles declared the railway would follow a route through eastern Merced county to a point in Mariposa close to the western entrance to Yosemite National Park. The articles further declared the railroad would use steam, electric power, and any other practicable motive power. At that time the director declared the capital stock of the company would be $5,000,000.00 in gold coin of the United States of America and that the number of shares would be divided in 50,000, each of par value of one hundred dollars. The origin of the railroad was to be in the town of Merced in the central Valley of California. The rails would be laid in a north-easterly direction across the plains to the Merced river near Snelling, there the river would be bridged and the rails would then follow the Merced near its northern banks in an easterly direction through Merced Falls toward the Yosemite Valley. The railroad would enter the Merced Canyon and Mariposa county, approximately 30 miles from Merced, and would weave along the river for 50 miles while clinging to the colorful and steep mountains that formed the canyon. The rails would pass through the Exchequer area, a site near one of the early banks in California. The railroad would again cross the river at Pleasant Valley and run on the southern banks until it was just down stream from the settlement known as Bagby where the rails would again cross to the northern side of the river. The rails would continue from Bagby to the western boundary of the Yosemite National Park. The above map shows the general location of the Yosemite Valley Railroad within California. Also, shows the connection to other railroads. Since a major portion of the railroad was built through the southern "gold fields" the forty-niners had prospected, some of the creeks and canyons were given colorful names by the gold seekers. Here are some of those names: Jones Flat, Temperence Creek, Hell's Hollow, Pine Canon, Humbug Gulch, Nameless Gulch, Flyaway Creek, Drunken Gulch, Quartz Mountain Gulch, Good Gulch and Sweetwater Creek. Those places were all in Mariposa County. In Merced County the rails crossed the Black Rascal Creek just a few miles east of the town of Merced. At milepost 14.7 the community of Hopeton, originaly ment Forlorned Hope, another unique name.